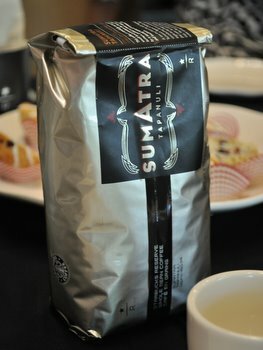 The other Starbucks Reserve coffee that I tried at the tasting event the other day was the Sumatra Tapanuli. Unlike the Kenya Tana River, this was not a coffee we tasted iced. Instead, we brewed it up in one of the largest french presses I’ve seen. To give you an idea of its size, our coffee master had to use both hands (and stand up for leverage) to push down the plunger! Getting back to the coffee, I generally really enjoy Sumatran coffees. They have rich berry notes and a great depth of flavor without the light citrus overtones that you find in a lot of South American and some African coffees. The Starbucks Reserve Sumatra Tapanuli was no exception. This was a rich coffee and, while it didn’t have all of the berry notes that I might have expected to find, it had a really earthy and chocolatey flavor to it. The earthiness was very deep, like very wet potting soil (Starbucks suggests this is a “mushroomy” note). The chocolate was dark, bittersweet and did have hints of berry, but they were subtle. It was delicious, and worked well in the french press. We paired it with maple scones that toned down the dark intensity of the coffee, but I definitely wouldn’t mind pairing this with an intense chocolate dessert or a few pieces of salted caramel.